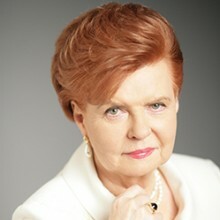 Dr. Vaira Vike-Freiberga is the former President of the Republic of Latvia (1999-2007). She played an instrumental role in achieving membership in the European Union and NATO for her country and raised the nation’s recognition in the world through her international activities, at the EU, and the United Nations as Special Envoy on UN reform, among them. Since the end of her presidency in 2007, she has been solicited as invited speaker on social issues, moral values, European historical dialogue, and democracy. Among her international activities, she was appointed by the European Council Vice-chair of the Reflection group on the long term future of Europe. In 2011-2012 she chaired the High-level group on freedom and pluralism of the media in the EU. Since 2014, she is President of the Club de Madrid of democratically elected former Heads of State and Government. Having left Latvia as a child refugee, she started schooling in a refugee camp in Germany in 1945, continued in French Morocco, and pursued higher education in Canada, with a Ph.D. in experimental psychology (1965) at McGill University in Montreal. Dr. Vike-Freiberga emerged as a prominent spokesperson on politics and science policy whilst Professor of psychology and interdisciplinary scholar at the University of Montreal (1965-1998). She returned to her native country in 1998 to head the Latvian Institute. Less than a year later she was elected President by the Latvian Parliament and re-elected in 2003. Dr. Vike-Freiberga is a member, board member or patron of 32 international organisations, including the World Leadership Alliance, the International Criminal Court Trust Fund for Victims, and the European Council on Foreign Relations, as well as four Academies. She has been awarded 34 Orders of Merit (1st class) and 19 Honorary doctorates, as well as many medals, prizes and honours, for distinguished work in the humanities and social sciences. She has published 14 books and authored over 200 articles, book chapters, reports, and audiovisual materials.